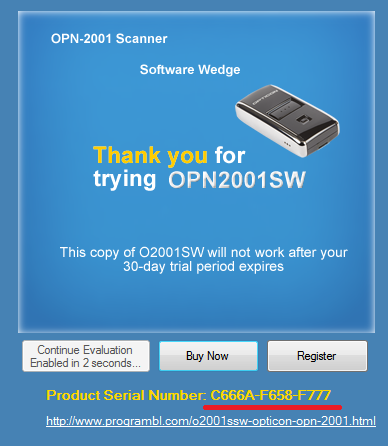 Can I try the O2001SSW for Opticon OPN-2001 scanners Ver 1.5.5 software before purchasing a license? Where can I purchase a O2001SSW for Opticon OPN-2001 scanners Ver 1.5.5 license and obtain a registration key? What Computing Platforms are Supported by O2001SSW for Opticon OPN-2001 scanners Ver 1.5.5? What kind of O2001SSW for Opticon OPN-2001 scanners Ver 1.5.5 licenses are available? What are the differences among available O2001SSW for Opticon OPN-2001 scanners Ver 1.5.5 licenses? If I buy a O2001SSW for Opticon OPN-2001 scanners Ver 1.5.5 license, can I use O2001SSW for Opticon OPN-2001 scanners Ver 1.5.5 on more than one computer? Where can I find O2001SSW for Opticon OPN-2001 scanners Ver 1.5.5 help? What is the O2001SSW for Opticon OPN-2001 scanners Ver 1.5.5 support email? Yes. Installing the software automatically entitles you to a free 40-day trial period. You can download the free trial version of O2001SSW for Opticon OPN-2001 scanners Ver 1.5.5 here. Please visit the O2001SSW for Opticon OPN-2001 scanners Ver 1.5.5 license and registration page. Please visit the O2001SSW for Opticon OPN-2001 scanners Ver 1.5.5 license page. Install a 40-day evaluation license of O2001SSW for Opticon OPN-2001 scanners Ver 1.5.5 free of charge. We encourage you to try out O2001SSW for Opticon OPN-2001 scanners Ver 1.5.5 with a free evaluation license first. Uses 'Product Serial Number' technology for copy protection and requires a separate license for each copy of O2001SSW for Opticon OPN-2001 scanners Ver 1.5.5. If you need more than one registered copy of O2001SSW for Opticon OPN-2001 scanners Ver 1.5.5, then you will need to purchase the corresponding number of licenses. If you are going to purchase two or more licenses at the same time, you qualify for additional discounts. The 'Product Serial Number' is an eight character hexadecimal code O2001SSW for Opticon OPN-2001 scanners Ver 1.5.5 uses to uniquely identify a computer on which O2001SSW for Opticon OPN-2001 scanners Ver 1.5.5 is installed. Then you can simply paste the 'Product Serial Number' into the appropriate field at the O2001SSW for Opticon OPN-2001 scanners Ver 1.5.5 registration site. The 'registration key' is a generated character code provided to you via email once you purchase a license and provide the unique 'Product Serial Number' generated by O2001SSW for Opticon OPN-2001 scanners Ver 1.5.5. You must enter the 'registration key' in O2001SSW for Opticon OPN-2001 scanners Ver 1.5.5 'registration screen' to complete registration and unlock the 'Full' version of O2001SSW for Opticon OPN-2001 scanners Ver 1.5.5 for use on your computer. New version of O2001SSW for Opticon OPN-2001 scanners Ver 1.5.5 allows you to copy the 'Product Serial Number' to the clipboard by clicking on a button labeled 'Copy'. You can simply paste the 'Product Serial Number' into the appropriate field at the O2001SSW for Opticon OPN-2001 scanners Ver 1.5.5 license and registration site. Pasting the hardware fingerprint into the appropriate field (vs. typing it in directly) helps minimize the chances of providing an incorrect 'Product Serial Number'.